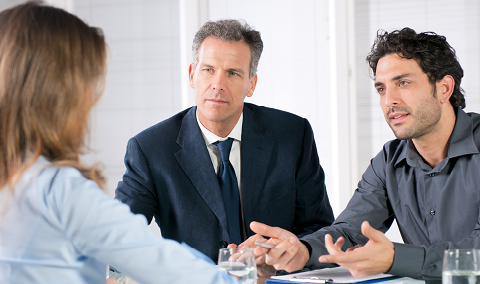 If any of that sounds familiar, this course is the forensic interviewing course for you. This course has been designed for Private Investigators, HR Professionals, Workplace Conduct Investigators, Compliance Investigators, Law Enforcement and Auditors. 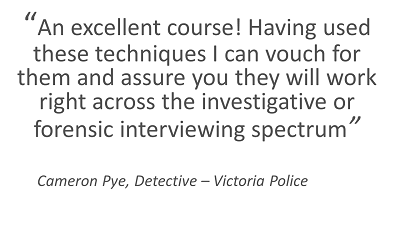 Regardless of your investigative capacity, if your role involves you conducting forensic interviews with victims, witnesses or persons of interest, this course is going to add value to your investigative skill-set. The knowledge and skills taught on this course align with contemporary UK Home Office approved interview protocols that continue to be used by law enforcement officers across the UK, Canada, Australia, New Zealand and Europe. If that's what you're looking for - hit the search engines, there are plenty of places online that will take your money for such training. This course comprises a wealth of theory and practical lessons designed to give you a strategic edge in any investigative interview or interrogation. The course contains knowledge distilled from the trainer's (ongoing) 25 year operational and teaching career in policing and investigations, put together in a professionally designed series of lessons. You'll be led through some core subject theory looking at subjects like memory and the cognitive interviewing principles. Thereafter, we'll look at the theory underpinning four essential core skills of investigative interviewing; planning & preparation, rapport, questioning and listening. We'll highlight some academic research demonstrating that by employing these core skills we can conduct ethical interviews that result in an increase in accurate and reliable information and evidence, and leave us better able to expose deception where it arises. Having covered off the relevant theory, we'll discover how we can use that theory to follow a couple of strategic interview models which will provide you with two fail-safe frameworks within which you can plan, conduct and evaluate investigative interviews with victims, witnesses and persons of interest, regardless of the levels of cooperation being experienced and regardless of the investigative context. We'll look at the 'Free Recall' and 'Conversation Management' models of interviewing and we'll consider how these models can be used with strategic and tactical planning designed to maximise evidential outcomes, every time. To embed learning, we'll be using visual aids and the TILES System® interview management software which will enable you to 'see' interview strategies being played out in real-time. This course has been designed to add value to any investigator, regardless of your experience or investigative remit. If you're seeking to expand your knowledge of investigative interviewing, and you wish to build your confidence and enhance your practical interviewing skills, this course will deliver you value. 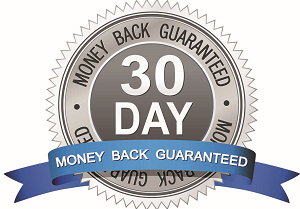 With a 30-day full money back guarantee, you can be confident that this course will add value to your investigative skill-set. Feel free to register for a free trial with no obligation (and no credit card required) to take a closer look at the course content. 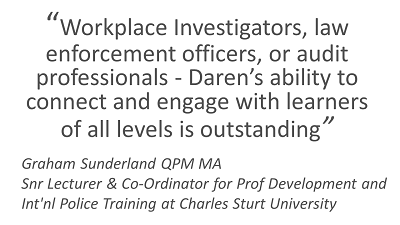 Daren is a Lecturer in Policing and the author and subject coordinator for post graduate studies in Investigative Interviewing. Formerly an Investigator with the Royal Military Police Special Investigation Branch (UK), Daren initially qualified as an Investigative Interview Trainer in 1996 and subsequently has been heavily involved in interviewing witnesses, victims and suspects in connection with fatal accidents, fraud and theft offences and a wide range of other criminal offences including sexual offences and other offences against the person. Daren is qualified as a UK Home Office Tier 3 Video Interviewer of sexual crime victims and significant witnesses of serious crime. Daren Jay's experience in investigative interviews its outstanding, highly recommended course for investigators of all levels. I imagine most participants will flow through the learning from the perspective of their own particular circumstances. I found that I already knew some of the theory sections and some of the interview process modules were familiar from other learning. However, the terminology and context was different enough to make it significantly interesting and useful. The presentation was clear and well paced. The TILES system is very logical and will streamline the actual interview process. I look forward to integrating this learning into my day to day workflow. I'm really pleased I took this course and I’m happy to say it was good value. I work in HR and I’ve had interview training as part of a Diploma in the past but it didn’t go into this depth. The models used are easy to understand and the presentations work well in explaining things out. I think I will be a lot more confident holding interviews now and would recommend this training as I think most types of investigators would get value out of it. This course is excellent. I can see how this could be useful to auditors, HR staff and managers in general that have a responsibility of managing staff and are involved in the disciplinary or performance management processes. Although difficult conversations with staff (or witnesses, victims etc.) may seem daunting this course highlights that it is just a 'conversation with purpose' It highlights that conflict is the biggest factor to avoid (build rapport) and shows that with the right planning the most complicated interview can be handled efficiently. 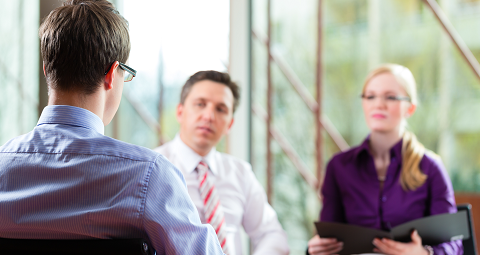 It covers the do's and don'ts of before, during and after the interview process. Great support (tutor is incredibly qualified with a wealth of knowledge) is always on hand and the course allows breaks so as not to overload anyone new to this field. You can do the course at you own pace and in your own environment (and no time required to travel to a venue). i have not seen any online training this good or comprehensive in this field. I felt that the course promotes confidence which can only result on more effective interviews and better results. I would recommend this course to anyone who conducts interviews, (even for experienced interviewers, it is a great way to evaluate if you have allowed any bad habits or short cuts into your techniques and/or processes). I look forward to doing more from this provider in the future. I thought the course was quite comprehensive and will be useful for other staff members, particularly for those who don’t have a law enforcement background. ( I have a semi-law enforcement background as I spent several years with Immigration – however I have not undertaken the cert IV in Investigations) I think the techniques explained can be adapted to our line of work, and picked up some useful tips around interviewing. Three aspects I found particularly valuable were: -	The concept of context reinstatement in the memory module, to assist witnesses with recalling details -	Identifying vulnerable/intimidated interviewees (we often have witnesses in child care who don’t want to provide information due to fear of repercussions from their employers/colleagues) -	The conversation management interview technique and planning for this technique – I think this will be especially useful and plan to use this when interviewing my POIs. It was good having the course broken into short modules, as I believe it is easier to digest the information in shorter lots. One thing I might suggest is having all the modules released at once, that way people can work through the course at their own pace and won’t have to wait a day or so for the next lot of modules to be released. Use of the home invasion case study was helpful in applying the theory, particularly with the conversation management interviewing. I found that by seeing how the method was applied with an actual example I better understood how to break down and structure the interview and get the most out of the evidence. I also think the quizzes are a good addition and should be kept – this helps the user engage with the course and makes them think about what information they’re taking in, rather than just listening to a recording and not really retaining the information. Overall I think this course will be useful for our team (even for those who have the cert IV – it would be a good refresher and may reinforce some of the techniques they already know).